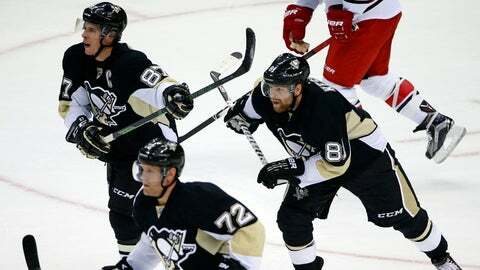 With Phil Kessel (right) joining Sidney Crosby in Pittsburgh, the Penguins are doubling down on their offensive firepower in their bid to make it back to the Stanley Cup Final for the first time since 2009. For the first time in half a dozen years, there is little consensus on which teams are the top Stanley Cup contenders. Pick a media outlet and you’ll get a different choice for who will hoist the hardware this spring. Chicago lost 10 players from its 2015 championship team, Los Angeles didn’t make the playoffs after winning the Cup in 2014, the New York Rangers have played more postseason games (76) since 2012 than any team, Washington and St. Louis have no playoff karma, Boston’s blue line has been gutted and Pittsburgh and Anaheim still have major questions on their blue lines. That doesn’t even account for Tampa Bay, which made the Stanley Cup Final last season. It doesn’t account for Montreal goalie Carey Price, who won the Hart Trophy as MVP. It doesn’t account for Western Conference upstarts Minnesota, Winnipeg and Calgary, all of whom are on the rise. "It’s very wide open," Calgary general manager Brad Treliving said. "The league has become so hard; so difficult. If you can just get into the playoffs, I think anything can happen this season." 3-on-3 overtime: In an effort to reduce the amount of games that go to a crapshoot, er, shootout, the NHL has replaced the 4-on-4 overtime with 3-on-3 play. Overtime will still last five minutes and shootouts will immediately follow games that are still tied, but in the preseason, a majority of the games that experimented with 3-on-3 were decided before a shootout was needed. Oh yeah, 3-on-3 play is way more exciting than 4-on-4 play. The Islanders’ new home: The erstwhile Long Islanders got off to a rough start when their shrill new goal horn was rejected by the masses and shelved after a short trial period. Still, the idea of the Islanders playing in Brooklyn is cool to almost everyone but the purists who still pine for the dump that was Nassau Veterans Memorial Coliseum. The newfound proximity should ramp up the Rangers-Islanders rivalry another notch. As a reminder: Brooklyn actually forms the western end of Long Island. No need for a name change. New officials: The league has added referee Jake Brenk and linesmen Devin Berg, Brandon Gawryletz and Ryan Gibbons for the 2015-16 season. Evgeny Romasko will also become a full-time NHL ref after splitting last season between the AHL and NHL. That’s five pieces of fresh meat at which you can direct your scorn. Calgary Flames: The Flames defied analytics last season with an unsustainable shooting percentage, poor possession numbers and a maddening penchant for falling behind. Calgary led the league with 10 wins when trailing after two periods. Treliving made a pair of savvy moves this offseason that could help the Flames stop cheating the undertaker. He added big, 22-year-old defenseman Dougie Hamilton (6-5, 212) to a blue line that already features Mark Giordano and TJ Brodie, giving the Flames one of the best defensive corps in the NHL. He also added versatile forward Michael Frolik, an adept penalty killer who can move up and down the lineup. "He’s like a Swiss Army Knife," Treliving said of Frolik. "He does so many things well. He’s not a guy who will lead your team in scoring, but he helps you win." Calgary stunned the NHL cognoscenti by earning the Western Conference’s final playoff spot last season. With the aforementioned blue line and a maturing cast of talented forwards including Johnny Gaudreau, Sean Monahan and Sam Bennett, the Flames are aiming to challenge the West’s elite powers. Vancouver Canucks: Vancouver rallied from a one-year playoff absence by finishing second in the Pacific Division. The addition of sniper Radim Vrbata (31 goals) and a fast start helped the Canucks hang onto that spot, but by the end of the season, it was apparent they had lost their mojo. Calgary eliminated Vancouver in six games, precipitating a curious offseason in which the Canucks traded younger, more effective goalie Eddie Lack instead of Ryan Miller; traded younger, more productive Nick Bonino for Brandon Sutter; and traded Zack Kassian for Brandon Prust, who is seven years older. Canucks GM Jim Benning said the moves were emblematic of a team in transition? A transition to what? Stars Daniel Sedin (35), Henrik Sedin (35), Alex Burrows (34) and Vrbata (34) are also aging. Are the Canucks preparing to bottom out? Boston Bruins: Boston was the laughingstock of the NHL at the draft. The Bruins shipped young, building-block defenseman Dougie Hamilton to Calgary for the 15th, 45th, and 52nd overall picks, perhaps assuming that Zdeno Chara, 38, will play forever. They shipped rugged forward Milan Lucic to Los Angeles for backup goalie Martin Jones, a pick and AHL defenseman Colin Miller, and they dealt center Carl Soderberg to the Avalanche. On the flip side, they added forwards Matt Beleskey and Jimmy Hayes and still have a solid core that includes center Patrice Bergeron, David Krejci and goalie Tuukka Rask. It’s hard to envision the Bruins missing the playoffs a second straight season, but Boston does not look like the perennial Cup contender it was from 2011-14, and if Chara’s current upper-body injury forces him to miss much time, well . . .
Patrick Kane saga: We still don’t know whether Kane’s sexual-assault case will make it to a grand jury. At least the daily revelations have subsided as the Blackhawks prepare to begin defense of their third Stanley Cup in six years, but it was a curious decision by the franchise to bring Kane to training camp. Regardless of whether he is charged, the distraction the case creates — and may continue to create — is a big one. On the flip side, this is a team that has won three Cups in six years and has some of the best leadership you’ll find on an NHL roster, starting with unflappable captain Jonathan Toews. The Blackhawks have been under the media spotlight for a long time. Maybe this will feel like business as usual for them. Pittsburgh’s go-for-broke approach: Aware of the accurate criticism that he was wasting the prime years of Sidney Crosby’s career, Pittsburgh GM Jim Rutherford got busy this summer. He added scoring forward Phil Kessel to give Crosby a sniper on his wing, he added Nick Bonino for scoring depth and Eric Fehr for center depth, and he lured 25-year-old Russian forward Sergei Plotnikov from the KHL, where he had 145 points in 159 games over the last three seasons. Plotnikov will play alongside countryman Evgeni Malkin. If the Penguins don’t get back to the Cup Final for the first time since 2009, it won’t be on the offense. Expansion: Las Vegas and Quebec City were the only two cities to bid for expansion franchises when the league opened up the process. That doesn’t mean they’ll be earning franchises. The NHL is moving slowly as it ponders growth, and there are significant concerns in both markets. In Las Vegas, there is no track record of a successful pro franchise, odd working hours for the labor force that would presumably be fans and the ever-present specter of gambling. Quebec is a small market in a nation where the currency has plummeted in value in the past year, leaving some to wonder if it would be a further drain on the league’s revenue-sharing pot. The Board of Governors will meet again Dec. 7-8 in Pebble Beach, Calif., when a decision could be made on both cities. Connor McDavid, C, Edmonton: The No. 1 overall pick is considered a generational player who could join the Gretzky-Lemieux-Crosby pantheon of the game’s greatest modern-era centers. At age 18, it’s too soon to expect McDavid to lift the woeful Oilers to their first postseason berth in 10 seasons. Edmonton has all kinds of issues with attitude, work ethic and defense. On the flip side, he does appear to be the rare talent that even this lottery fixture can’t screw up. A viral preseason video of him backchecking from the offensive zone to break up a play at the other end is the kind of example this offensively talented but character-deficient team needs to turn the corner. Phil Kessel, F, Pittsburgh: Not only has Kessel escaped the Toronto Petri dish, his landing spot could not be better. The 28-year-old wing will have two main jobs playing alongside Crosby: get open and shoot. Of course, he’ll have to score and he’ll have to take care of the other end, but if Kessel tops the 40-goal plateau again with the best player in the Eastern Conference passing him the puck, it’s doubtful many Penguins fans will complain. Mike Babcock, coach, Toronto: More than a few analysts have tabbed Babcock the best coach in the NHL over the past several seasons. We’re about to find out how much of his success came from coaching Nicklas Lidstrom, Pavel Datsyuk and Henrik Zetterberg. Babcock takes over the most dysfunctional franchise east of Edmonton. The Leafs have not won a playoff series since 2004, and they haven’t been to the Cup Final or won the Cup since 1967 — the longest drought in the NHL. Buffalo will challenge for playoff spot: The Sabres got a lot deeper up the middle when they drafted Jack Eichel and traded for center Ryan O’Reilly. Wing Evander Kane should be settled into his new surroundings, Cody Franson will add some pep on the blue line and Robin Lehner will settle the goaltending position. The Sabres may not make the postseason in an Eastern Conference that grew much deeper last season, but they’ll be in the mix, offering hope for the future. Chicago will bounce back: When the Blackhawks won the Cup in 2010, they endured a purge of talent similar to that of this offseason and due mainly to cap constraints. The Hawks barely made the playoffs in 2011 and exited in the first round for two straight seasons. With 10 players gone from last year’s title team, some have wondered whether the Hawks will suffer a similar fate, but this team has far more experience than that young club had in 2010. Chicago will be just fine. Hart Trophy (MVP): Sidney Crosby, Pittsburgh — With Kessel playing on his line, Crosby is going to put up big numbers this season. Voters like big numbers. That’s pretty much all they see. Crosby does a lot of others things well, but the numbers will earn him the award. Vezina Trophy (best goalie): Henrik Lundqvist, New York Rangers — The old man still has game at 33, and the Rangers defend as well as any team in the league. Time to put a second trophy on the shelf. Norris Trophy (best defenseman): Viktor Hedman, Tampa Bay — By the end of last season, the 24-year-old Swede was playing as well as any defenseman in the game. Tampa scores a lot, and that means Hedman will have plenty of assists and points. Remember what we said about numbers? It goes double for Norris Trophy winners. Ironic, isn’t it, since the job description of a defenseman would suggest something else. Jack Adams Award (best coach): Joel Quenneville, Chicago — Yeah, we know he probably won’t win it. It’s the curse of coaching such a star-studded lineup. Chicago lost 10 players off its Cup winning roster, however, and it will be dealing with the Kane issue a bit longer. When Quenneville has the Hawks back in the hunt, it would be nice to see him get his due. Calder Trophy (rookie of the year): Connor McDavid, Edmonton — He doesn’t have much competition outside Buffalo’s Eichel, the No. 2 pick in the draft. Coyotes center Dylan Strome went back to juniors, and Noah Hanifin probably won’t put up big enough numbers in Carolina. Selke Trophy (best defensive forward): Marian Hossa, Chicago — It would be nice to see someone other than Patrice Bergeron win this award. We thought Hawks teammate Jonathan Toews deserved it last season over Bergeron. This is one where superior numbers won’t help Hossa. Nor will the fact that he plays on the wing, but if voters would just watch the relentless way he plays the 200-foot game . . .
GM of the Year: Brad Treliving, Calgary — The aforementioned Hamilton and Frolik deals should put Calgary in the upper echelon of the Western Conference. Treliving has done a masterful job in his one-plus seasons since leaving the assistant GM post in Arizona. Anaheim vs. Pittsburgh: The Penguins made all the right moves in the offseason, and that will be enough to get them to the finals. Unfortunately for Pittsburgh, the Western Conference is still superior. The Ducks’ size and depth will be too much. Quotable coach Bruce Boudreau will finally shed the label of the guy who can’t win the big one.